Now. If you're sending any letters or emails to clients or prospects, you can't make the sale if you first don't get their attention. So, why not open your next sales letter (on paper or online) with a question? After all, a question in the headline got you to read this blog post. And you've already read this far. So it just might work. Long before its culture of "Delivering WOW Through Service" made Zappos the darling of the business world, a scrappy start-up in Memphis, Tenn., used outrageously good customer service to build a billion-dollar enterprise. That company was Federal Express (now FedEx). And I used to work for them. 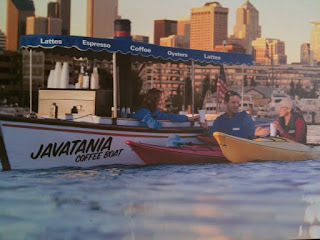 Back in the 1990s, they were the #1 client of the marketing communications firm that employed me. From 1996 to 1998, I answered the bulk of FedEx customer emails -- more than 10,000 of them -- from around the world. As a result, the FedEx culture of "People-Service-Profit" became second nature for me. The core philosophy that governs every activity at FedEx Express is People-Service-Profit (PSP): Take care of our people; they in turn will deliver impeccable service demanded by our customers, who will reward us with the profitability necessary to secure our future. People-Service-Profit: These three words are the very foundation of FedEx Express. You might say FedEx is the company that service built. Because, without the "do whatever it takes" attitude its employees displayed in the early days, it likely would have gone out of business. And our world would move a bit slower today. When Federal Express first went into business, we could not get RCA to use our services, despite the fact we had opened one of our first offices near their plant in Wilmington, Indiana. Then late one Friday afternoon, Diane, our clerk, got a call from a woman in Wilmington. "I don't know who Federal Express is," the woman said. "I've never heard of you. All I know is that my wedding dress was supposed to be here today. It's 3:30 in the afternoon and I'm about to panic -- I'm getting married tomorrow. Can you help me?" No manager was around Diane could ask for advice. So on her own, she chartered an airplane and pilot for $300 to fly the package to Wilmington. It arrived that night. Some of the key RCA executives were at the wedding and heard about the outrageous package airline that chartered an airplane for a wedding dress. Two weeks later, FedEx got its first order for 20 packages from RCA. Question: If you were to put SERVICE at the top of your company's priorities for the next 30 days, do you think you might get more clients talking about you? More clients buying from you again? More clients referring others? More profits? But is has worked for FedEx, Zappos, Nordstrom, Disney, and many others. Back in the 1990s, I doubled revenue twice in four years -- to a comfortable six figures -- for a resume service I operated amid fierce, price-cutting competition. The methods that worked then still work today. They can get you more clients tomorrow. Here's what I did: followed up, kept clients happy, and generated referrals. Using CRM software (Goldmine), I followed up by email and phone at least three times with every qualified prospect. And I used it to mail all clients at least once a year with news and/or promotions. If I were doing it today, I would use Salesforce.com as my CRM. And I would mail clients every month. Not email -- snail mail. Prospects would get a monthly newsletter by mail, too. My strategy was simple: I tried to over-communicate. That solved most problems when they were tiny flickers of dissatisfaction, before they grew into bonfires of anger. Examples: I told clients what to expect at every stage of the process, then told them exactly why I did what I did for them, to resell them on the thought that choosing me was a good idea. Also, I sent them an extensive "user guide" to help them actually use what I created for them. All of which worked very, very well. I used 10+ different referral methods, but the easiest to explain here is my formalized referral system. For every new client you send my way, I'll discount their order $20 (as a gift from you), pay you $20 cash, or send you a $20 Amazon gift certificate. I settled on these 3 choices after much input from clients. Any client who referred two or more people was upgraded to Best Client status in my CRM. These clients got more mailings, more phone calls, and all-around "rock star" treatment. They responded by referring even more new clients. Virtuous circle. None of them requires you to spend another penny on advertising. You can grow your business from the inside -- heck, double it -- by converting more prospects (by following up diligently), retaining existing clients (by keeping them happy), and "cloning" those clients (by generating referrals). Try any or all of these in your business. Grow your business from the inside. Repeat as needed. Your business may or may not be rated by sites like Angie's List or ePinions. Yet. But there will likely come a day when your business is rated versus your competitors using metrics not of your choosing. Metrics that may cause your clients to leave in the blink of an eye. For food makers, that day has arrived, in the form of NuVal, a nutritional-scoring system that shows at a glance how products stacks up against each other. The system, developed by health experts from Yale University and other institutions, uses nutrition data on food labels and other public information to calculate how well a product helps meet federal dietary recommendations. High levels of saturated fat, for example, can pull down the score while calcium can help raise it. Foods are ranked from 1 to 100; the higher the number, the greater the nutritional value. 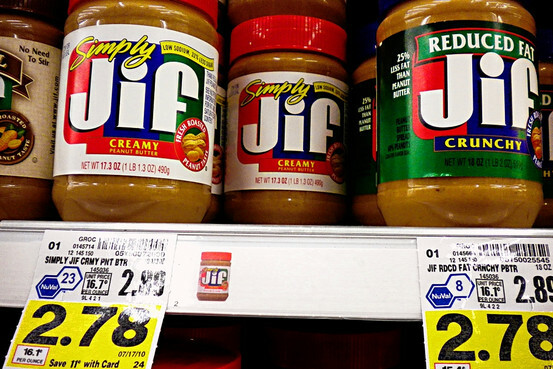 In the example above, Jif Creamy (left) scores 23; Jif Reduced Fat (right), scores 8. What would happen if a new ratings system appeared tomorrow that scored your business at 15 out of 100, and your competitor ... 75? Define your business before anyone else does, using criteria you choose and the competition can't match. When they visit your store or web site. When you send them an email. When you mail them a monthly newsletter. Define yourself now to the people who already trust you -- your current clients. Doing so can build a fence around them, making it less likely they'll jump to your competition for reasons (or ratings) beyond your control. Do You Have Customers or Clients? If you run a small business, do you want to get paid like a cashier? Or a six-figure professional? To get paid what you're worth, it may help to take another look at the people who buy from you. What do you call these people -- customers or clients? Kmart has customers. So does the Post Office. And a used-car lot. By contrast, a sports agent has clients. So does an attorney. And an architect. The term customer implies a short-term transactional relationship, based mainly on price. By contrast, client implies a long-term personal relationship, based mainly on service. Big Question: Which would you rather have -- customers or clients? Then: What will you do differently, starting today? What if you could get paid twice every time you did something for your clients? Would you do that thing? Well, here's the thing: thank them for doing business with you. Because an emailed "thank you" has about the same effect on your clients as an emailed birthday greeting would have on your mom. Also, people refer businesses they like to their friends. We don't refer jerks to our friends. Or our friends won't remain our friends for long. Start thanking your clients by mail today, and reap the double payback tomorrow. If you're in business, you're in marketing. Marketing can be defined as follows: Everything you do to get and keep customers. The corollary is this: Everything you do is marketing. Because everything you do every day can get and keep you more customers. If you do it right. From the moment you walk into your office until quitting time, it's all marketing. Challenge: Think of one thing you do every day that seems trivial. Then think of it as marketing. How can you treat your voicemail greeting like the marketing activity it really is, so that people calling your business after hours will be more eager to buy from you? Write and practice a script for your voicemail greeting. The goal is not to read it word for word, but to avoid rambling. Stand up and smile when recording your voicemail greeting. When you do, your positive energy clearly comes through the phone. All things being equal, people prefer to buy from people who are friendly and positive. Give people a reason to leave their name and number. Offer them a discount code or the promise of a freebie -- when you call them back. This cuts down on hangups. So: It's all marketing. Yet, you can't improve it all. Not in one day, anyway. But you can pick one area of your business that's under-performing as a marketing function. And you can polish that one area until it brings in more revenue. Starting today. Here's an axiom of business: Give your clients what they want, and they will give you what you want. But ... what if you went beyond wants and gave your clients what they craved? How successful could you be if you were in the crave-fulfillment business? Good news: Not only is it fairly simple to give your clients what they crave, it's also inexpensive, and 100% legal. How did it feel as a kid when your parent or other adult told you, "Nice job!" after you did something noteworthy? How did it feel the last time your family/friends told you how happy they were about a favor you had done them? How did it feel the last time you got a round of applause, congratulatory email, or thank-you note in the mail? Appreciation feels pretty darn good. Yet, such moments are rare, aren't they? Perhaps that's one of the reasons we crave appreciation -- we rarely get it. Which is a golden opportunity for you. Simply show your clients how much you appreciate them, and they will return the favor with increased loyalty, repeat sales, and referrals, to name but three ways. Now. Do you think all this "client love" stuff is a bit warm and fuzzy? Think about this: The pay-off for appreciating your clients can be rivers of cold, hard cash. Just ask Zappos, Nordstrom, Virgin Airways, or Apple. If 80% of success is showing up (says Woody Allen), here's a corollary: 50% of business success is speaking up (says me). I order used books from Amazon. A lot. About 4-10 a month. I order so many books that, by the time they arrive in the mail, I can't remember when I ordered them or from what retailer. All I know is that I expect my books to arrive in good condition, as soon as possible. Which is a screaming opportunity for any smart bookseller who can find a way to do something memorable and de-commoditize themselves. Behold the packing slip at left, which was the first thing I saw when I opened the package from them today. 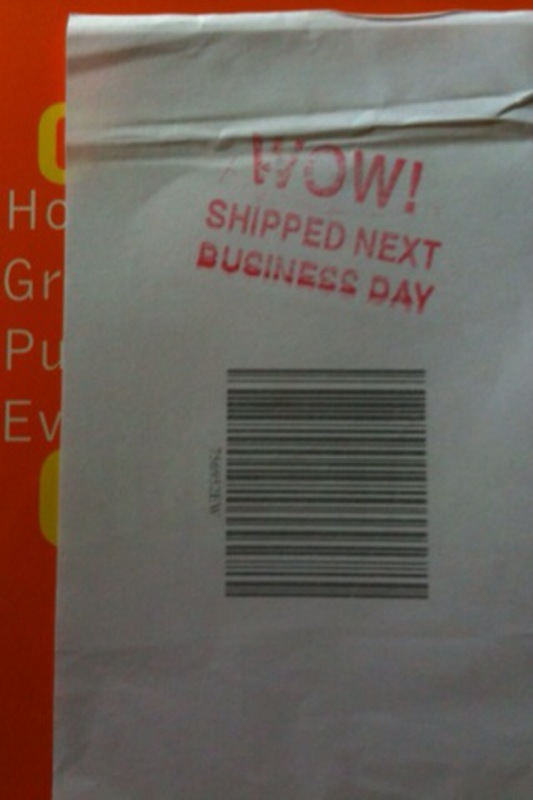 Not only did they ship my book promptly, they told me so. They even told me what to think -- "Wow!" Now. 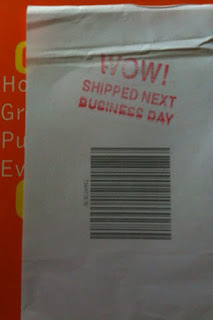 Is prompt shipping an example of remarkable customer service? Yet, here I am remarking about it. Because, after 10+ years of ordering books from resellers on Amazon, this is the first time I can remember being told how fast my order shipped. None of the dozens of other stores I've ever purchased from ever pointed their shipping speed out so clearly. YourOnlineBookStore.com is the first to do so. And they did it playfully. Which makes them remarkable, in my book. What did it cost them? About $20 for a customized rubber stamp and a pad of red ink. Question: How can you let your clients know how well you're serving them? Today? The "not so magic" formula is this: Serve + Tell = Happiness. And what is a happy client worth to you, in our hyper-networked world of word-of-mouth power (WOMP)? I'll let you do that math. A proven source of long-term revenue growth is to sell new products and services to your existing clients. Because your existing clients already trust you enough to give you their money. They're sold on your business and, thus, "pre-sold" on any new products or services you introduce to them. So. How can you find ideas for new products and services? Hart suggest you divide your clients "into clusters who are like-minded or have similar needs. By looking at new ways of segmenting your markets, say by needs rather than industries, you can find new product opportunities. For example, you might find that a painting contractor, an insurance firm and a small manufacturer all have a need for a certain back office job. You might then re-segment your market by that need" and introduce a new product or service to fill it. Many things your clients do are slowed down by certain activities -- bottlenecks. Like forms processing, time to implement, production steps, etc. Example, according to Hart: "In the 1800s, the critical bottleneck in making cotton garments was getting the cotton seeds out of the cotton fibers. Eli Whitney's cotton gin ("gin" = engine) used spinning hooks to remove the seeds much faster," resulting in a 50-fold production increase. Find one or more parts of a process that you can speed up for clients and, presto! You have a new product or service. Bottom Line: You can spend your hours and money convincing total strangers to favor you with their business, as most of your competitors do. And how's that working out? Or you can introduce new products and services to your existing clients, and enjoy the dependable new revenue that comes from the people who know and trust you. Although I focus on growing your business from the inside, by optimizing your current marketing and mining your client list for repeat and referral sales, I recognize that you do have to advertise. Over the years, I've forked over a lot of money on advertising, much of it on pay-per-click ads on search engines. Yet, despite spending six figures on both Yahoo and Google, only one of them has treated me special. 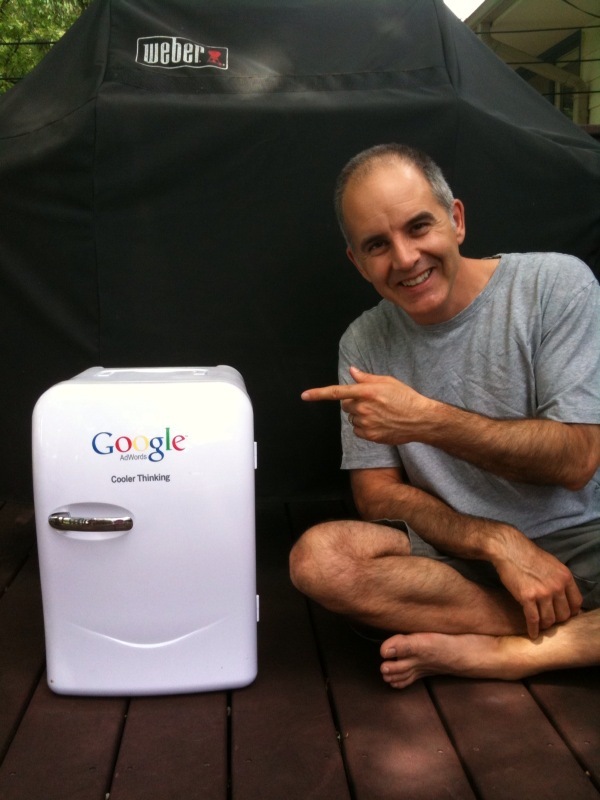 Google sent me this refrigerator about 4 years ago, after I spent my first $100,000 on AdWords. Since then, I've received other Google goodies, like a digital photo frame, a key chain, water bottle, etc. From Yahoo? Nothing. Nada. Zilch. Now. Which company is more remarkable in your mind, Yahoo or Google? Remarkable companies do remarkable things for their clients. Like Google. So: What remarkable things have you done lately for your clients? You'll know it when they call to thank you. Or when they refer their friends to your business. Or write about you on their blogs. Hint: In a world in which client recognition is almost non-existent, it isn't that hard to stand out. You certainly don't have to send refrigerators to your clients. You can start by saying thank you. It's a basic human need: We want to belong to something bigger than ourselves. A family. A gang. A team. A club. The desire to belong -- to be a member -- tugs at our hearts like a tractor beam. Smart businesses know this and use the pull of membership. The Futurist sells a magazine subscription disguised as membership. AARP sells insurance disguised as membership. American Express sells a credit card disguised as membership. In competition with other insurance firms, magazine publishers, and credit card companies, AARP, The Futurist, and American Express have a distinct advantage: They changed the rules. They differentiated. Instead of selling commodities, they sell membership. And they face less competition as a result. Question: How can you create a feeling of membership in your business? What can you say or do for your clients this month that would make them feel like members? You'll get fewer defections, more back-end sales, and more referrals when you do. What is Your Client Retention Budget? If your business is doing any business, you have a marketing budget. And most or all of that budget is devoted to client acquisition -- search engine marketing, Yellow Pages or Angie's List, print advertising, direct mail, media relations, etc. But. Do you have a client retention budget? If not, create one. Today. Find the money somewhere. Anywhere. Because, as we know (and forget), it's more profitable and easier to sell to existing clients than new ones. More profitable because you don't have to buy advertising to attract them (they're already in your database). And easier because you don't have to work as hard to sell them (they've already given you their money once). Resolve to spend a fixed percentage of your marketing dollars on retaining clients today, so you can sell more to them tomorrow. Here's an easy way to do it. Say: "Thank you." When was the last time you got a thank-you letter from a company after giving them your money? Can't remember? Good. See how easy it is for you to stand out and generate good will among your clients? Here, by the way, is a link to the only thank-you letter I've received from a company in at least two years. Do you think they're going to get repeat business and referrals from me? ask for referrals. Say: "What one person do you know that we could help?" Mailing a thank-you note after the sale can nip most service problems in the bud, while turning satisfied customers into raving fans who recommend your business to others. ... customer retention has a powerful effect on profits. Surveying 100 companies in two dozen industries, Reichheld consistently found that the longer a company keeps its customers, the more money it makes. One auto-service firm made three times as much profit from fourth-year customers as from first-year customers. Reducing that company's customer defections by just 5 percent increased overall profits by 30 percent, Reichheld says. Customer retention also helps overall growth. For a typical company that loses 15 percent to 20 percent of customers annually, Reich-held says, cutting defections in half will double its growth rate without having to introduce new products or develop new markets. Thanking your clients is more than good manners. It's the first step in your all-important efforts of delighting and retaining them. Which sets your business up for reliable, long-term profits in the future. Steinbrenner, a shipping magnate, bought the Yankees in 1973, turning the organization into one of professional sports’ premier franchises. Under his ownership, the Yankees won seven World Series and 11 American League pennants. His tenure as Yankees owner — and his deep pockets — also made him one of the most controversial figures in baseball .... [including] his habit of spending markedly more than other teams to acquire the game’s best players. When Steinbrenner bought the Yankees in 1973, they were perennial cellar dwellers. Long gone were the glory days of Ruth, DiMaggio, Berra, and Mantle. But by 1977, the Yankees won the first of 7 championships under his ownership. Questions: Why did you start your business in the first place? What excited you so much that you were compelled to go into business for yourself? Now, what can you do this week to recapture some of that "lost glory" in your business? Example: Write a letter to or call your first 10 clients to thank them for supporting you in the beginning. Maybe offer to buy them lunch at a special round-table meeting. The resulting goodwill and referrals will likely repay you many times over. Steinbrenner was a man in a hurry. Instead of waiting for great players to develop in the farm system, he went out and bought them. The results were victory after victory, championship after championship ... not to mention the lasting enmity of his competitors, who couldn't (or wouldn't) spend like him. Questions: Where are your best clients "playing" right now? How can you acquire the best of them, quickly? Example: Let's say you deliver leadership training, and your best clients are typically real estate and financial services professionals. Where are those clients "playing" (doing business) right now? Well ... they all use banks. Could you not "acquire" these clients by putting on a free seminar, held at a bank, which promotes your services to its real estate and financial services clients? The bank wins by delivering a free seminar with a high perceived value. And you win, if your seminar is any good, because you will turn a portion of attendees into paying clients quickly; you can put the rest on your mailing list ("farm system") and convert them to paying clients over time. The late Charlie "Tremendous" Jones once said, "You are the same today as you will be in five years except for two things: the people you meet and the books you read." 1. Who are the five people you spend most of your time with? Example tactics: You might recruit someone you admire to join a new business-building group that you volunteer to organize. Or you can replace one person with a new class of people -- stop having lunch with one negative "friend" and start having lunch with your best clients. 2. What books do you read? Try to read at least one book in your field every week. You can get through 25 books in only 6 months -- enough to make you an expert in almost any area. Example tactic: Declare your intention to a friend or family member, to hold yourself accountable. Or tell the world and blog about it. Love has nothing to do with money or profits, on the face of it. Yet, as I wrote yesterday, love (for customers and employees) is the "killer app" at the heart of such hugely successful businesses as Zappos, Nordstrom, Land's End, and Southwest Airlines. Warren Buffett believes in love, too. In the video below, he shares the best advice he ever got in life. It has nothing to do with money, on the face of it. "The biggest lesson ... was the power of unconditional love. I mean, there is no power on earth like unconditional love. And I think that if you offered that to your child, I mean, you’re 90 percent of the way home. There may be days when you don’t feel like it -— it’s not uncritical love; that’s a different animal -— but to know you can always come back, that is huge in life. That takes you a long, long way. And I would say that every parent out there that can extend that to their child at an early age, it’s going to make for a better human being." What one thing could you do today to show unconditional -- but not uncritical -- love for your customers? Make a phone call to a customer you've been dreading to talk to, and let them tell you exactly what's on their mind? It may lead to a new product/service idea, or a referral -- or both. Offer an unexpected post-sale bonus to the last 5 people who bought from you? This nearly always produces word-of-mouth advertising -- the best kind. Cheerfully accept a refund request from an unhappy customer and do whatever it takes to turn this negative into a positive? Example: In the past, I've asked customers to write testimonials after requesting refunds, which I then used in my marketing to say, in effect, "Even the clients we can't help recommend us!" Showing love in these cases may be tough. Call it "tough love" then -- tough on you, easy on your customers. But when you show true, "tough" love for your customers, you may be creating the world's greatest advertisement for your business. The book Delivering Happiness is on every best-seller list, and with good reason. The author, Tony Hsieh, turned a good idea (sell shoes online) into a billion-dollar venture called Zappos (you've heard of it?). He succeeded by adding a simple element to online commerce: Make customers and employees happy, and the profits will follow. By making product returns easy and all dealings with Zappos fun, Hsieh (pronounced Shay) created legions of customers for life who gladly refer others, while building a loyal workforce that comes to work every day with passion. But it turns out that Delivering Happiness was anticipated 7 years ago by an excellent book that's still worth reading today: Love Is the Killer App: How to Win Business and Influence Friends , by Tim Sanders, a former Yahoo! executive. I read it about 5 years ago and fished out my notes, to share with you here, in the hopes that you can use its lessons to get more clients like your best clients -- just as Zappos does. In a nutshell, Sanders argues that business as warfare ain't the way to go. Instead, true success comes only when you care genuinely about your clients and other "bizpartners." Spreading your "bizlove" is "the act of intelligently and sensibly sharing your intangibles with your bizpartners." Your knowledge -- everything you've learned in your life. Sanders recommends reading as much as possible, as much like a student as possible. To wit, make notes in your books so you can grasp the big ideas, then share them with customers, partners, and friends. When Love is the Killer App was written in 2003, blogging wasn't yet widespread and Twitter didn't exist. Today, these two tactics let you quickly share your knowledge with as many people as possible. Your network -- all the people you know personally and professional ... and all the people they know. Like knowledge, your relationships increase in value the more you share them. Sanders suggests you become a "connector" and serve as a hub for relationships that add value to the lives of your clients and others. Example: If you sell dry cleaning services and you know the best tailor in town, wouldn't it make you look like a hero in the eyes of your customers if you shared that relationship with them? And wouldn't it profit your business if that tailor referred others to you? Too bad it took a big, hairy, audacious, billion-dollar success story like Zappos to reawaken so many people to the idea that loving your clients is good for business. But smart companies like Nordstrom, Land's End, Southwest Airlines, and The Vermont Country Store have "loved" their customers for years. Forget client service. Do you love your clients? And do you show it to them, by delivering an experience that's exceptional? Remarkable? Something that leaves clients feeling like they got more than they paid for? You'll know that you're spreading "bizlove" -- and delivering happiness -- when you see it: Clients who are excited to buy, who buy again, and who refer others. Two Guarantees. Which is Better? I write a lot about how guarantees can grow your business by removing the risk of buying from you. I learned about the power of guarantees working for FedEx as a Webmaster from 1995-1998. One key to the success of FedEx since its inception in 1973 is their money-back guarantee -- your package will get there on time, or it's on them. Today, companies like Zappos are enjoying similar success using money-back guarantees. But ... there's a right way and a wrong way to make a guarantee. Below are two recent examples. Which works better, do you think? I think it's effective. The language is clear, non-salesy, reassuring. He goes the extra mile by going beyond Paypal's 60-day refund limit and promising to "send you a check if I have to." This guarantee should increase sales, though he could sell a LOT more if he included a real-world mailing address and phone number on his site, along with testimonials, to prove he's really real. I think it falls short. It starts off in fine fashion, billing itself "The Strongest Antiques' Guarantee in the World!" and promising a duration of 5 years and a 5% annual return on investment. But then the lawyers take over. The second paragraph of weasel words (italicized, for harder reading! ), while perhaps necessary, undermines the whole guarantee. (Never use the word "prorated" and expect it to boost sales, for example.) After reading paragraph two, I'm no longer impressed. Pity. While I'm no lawyer, they could have said something like this: "Some reasonable conditions apply. Example: You can't buy a Queen Anne chair, toss it in the East River, and ask for a refund. Please contact us for details." Just because you have to make restrictions on a guarantee doesn't mean you have to include them all upfront, nor does it mean you can't have fun with them. Final note: There's no limit to how bold and creative you can be in crafting a guarantee for your business. Yes, offering to give your customers their money back may cost you a few bucks in refunds. But if your products or services are any good, that won't happen often -- people are more honest than we think. That's been my experience since 1996. And if your sales go up 25%, 50%, 100% -- or more -- will you really care about refunding 1-3% of them? Double Chocolate Fudge Coca-Cola Cake. When my wife read that name out loud to me, I dropped my muffin. How can your attention not be grabbed? The marketing is baked right into the product name. Literally. Question: What's the most intriguing name of any product or service in your industry? And how can you go it one better by taking a page from the Baked In playbook and devising a name that sells itself? It may help to pretend you're creating a dessert menu -- what name would you give your product or service if it had to compete against Double Chocolate Fudge Coca-Cola Cake? If Cracker Barrel can come up with a name like this for food most people won't admit to eating, you ought to be able to do likewise for at least one product or service that puts food on your family's table. One of the best things about living in the Twin Cities is that we're only a 90-minute drive from The Spam Museum, in Austin, Minnesota. Which is where I picked up the valuable item below. Think of it: Fly swatter = ordinary. 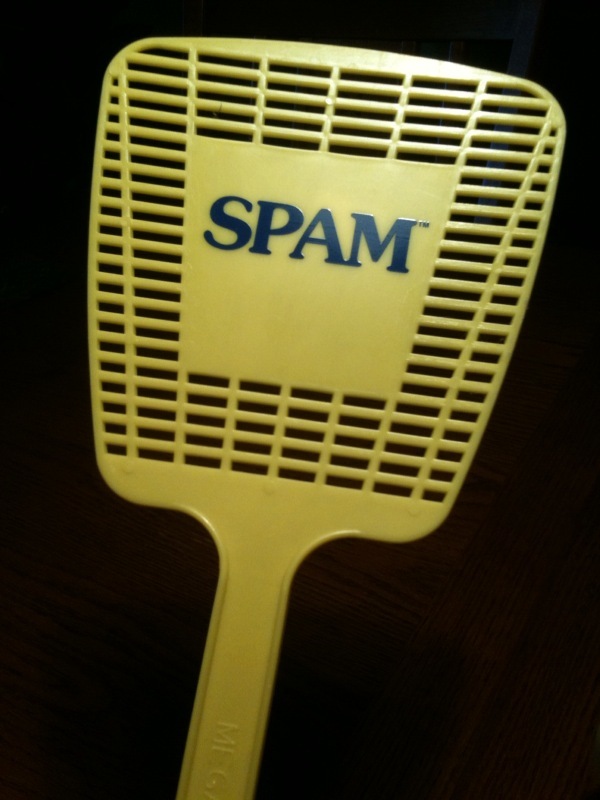 Spam = extra. 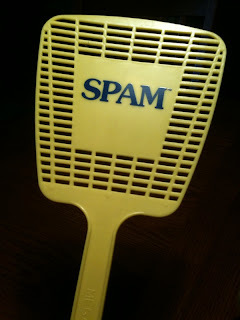 Fly swatter + Spam = extraordinary. That's 0 + 1 = 2. Use this formula to assemble combinations for new products and services. Think: What's an ordinary thing about who you are or what you do in your business? And how can you pair it with something "extra" to create an extraordinary new product or service? Try this: The news = ordinary. Comedy = extra. The news + comedy = extraordinary (The Daily Show). Or this: Ice cream = ordinary. A fried waffle = extra. Ice cream + fried waffle = extraordinary (the ice cream cone). 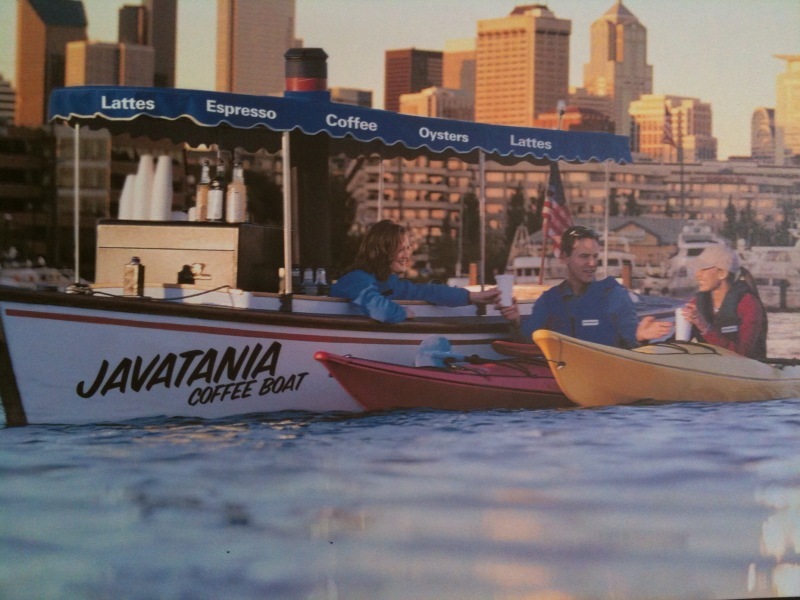 Coffee + boat = extraordinary (a floating coffee shop). My secret use of Twitter: it's a public bookmark. If I see a remarkable Web page, I quick-read it, Tweet it, then review it later when I have time to extract all the good ideas. Also, Twitter functions as a petri dish for this blog. About half the posts here began as Tweets, then incubated in the dark recesses of my brain until sprouting into fully formed thoughts. 1) Review your web browsing history. Pick the most remarkable page. Tweet it. Then review that page and pull out one good idea for use later. 2) Review your Tweetstream. Pick the most interesting one. Expand on that Tweet until you get to 250 words. Post it on your blog. Today is July 1, the first day of the seventh month. The second half of the year starts today. So. How was the first half for your business? If you're not having your best year ever, don't fret. The best coaches in football, basketball, and soccer are masters at making half-time adjustments. They analyze what they did in the first half, looking at what worked and what didn't. They analyze what the other team did, to defend better and exploit any weaknesses. Then they script the first few plays of the second half, to start off with bang. If business were a game (it is) and you were coaching your team (you are) what adjustments would you make before the second half?